Call Boat Owner Robert 305-745-8844 701-298-0349 701-219-0209. Sport fisherman with all the goodies. Custom built tower with 4 line outriggers and 15 rod holders. This tower has a surrey top with autopilot on bridge. The control area has complete enclosure for fowl weather. New vinyl glass above the windshield and the white Biminis and surrey top were replaced a year ago. The boat was put into service in 2004 as it was a show boat for Wellcraft. It has very low times with 301/304 hours with one owner since new. Twin 8.1 Horizon 370 HP V8 gas engines. Electronics include a Mercruiser Smart System with new screen unit, VHS radio, Ray Marine L760 chart plotter with Raymarine ST8001 autopilot and Garmin 3206 system with 24inch radar and also 1 MG depth finder for deep water sounding. All pumps and electronics operate and most pumps have been replaced. All interior cloth upholstery/curtains and carpet were replaced new 2 months ago. Just installed new upholstery pads on the rails in fishing area. This boat has a tremendous cleaning and bait station with built in tackle box and line holders. Huge live well and compartments. The cabin has all the amenities with 16000 BTU A/C, toilet/shower with hot water, fridge, and galley with built in coffee maker, 6 disc CD changer and will sleep four. The unit has shore power and also a 7KW Onan Gen set. Remote spotlight, and Windless with 150ft chain with up/down switches lanyard and anchor. The boat is equipped with all safety equipment (Halo fire suppression, life jackets and emergency flairs). The boat takes rough water and has a great fishing deck. Just one great fishing/cruising boat. This boat has been on a lift for its lifetime and has had fresh water washouts in the gen and engines after use. Owner had heart attack and is slowing down. 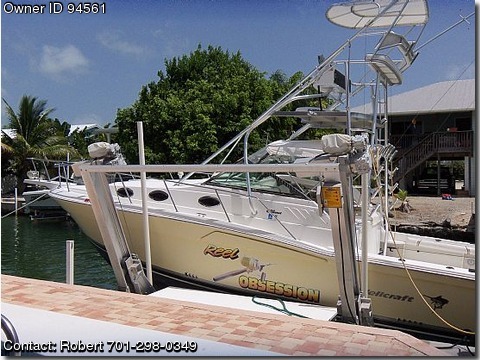 Asking $65995.00 / OBO Boat located at Cud Joe Key FL and drive away.